Humanism is the focus on the accomplishments of the individual. This idea originated in classical Greece. Humanism developed 1400 through 1650 and the idea of the focus on the individual got brought back by the Renaissance. Humanism went into many different directions. Art was a major part of Humanism since humans were able to express themselves through painting and sculpting. Some of the very humanist and classical Greek philosophers like Thales of Miletus, Xenophanes. They thought a lot about Protagoras famous statement, “man is the measure of all things”, which got represented in a lot of different sculptures and paintings. For the Greeks the main reason to focus on art was because of the human body. In the time of 1400 and in the Olympics their only inspiration for sculpting was the human body. They glorified the human and thought that it was perfect and that this was the most important thing that God had ever created. They believed that the man was the most important creature in the universe. The Greek art was splitted into three different periods: the Archaic, Classical and the Hellenistic. The Archaic was the earliest and least developed; it was rough and stiff. The second, classical period was a bit more developed and smooth. The last period was the most decorative and flowery period of all. Greek art was different than most of the art from that period and later on. Greeks did not make this to express their feelings. They focused on perfect proportion and form. There weren´t only three different periods for art, but also for sculpting and architecture. The Doric, Ionic and Corinthian. The Doric was very sharp and heavy, yet simple. Then the Ionic, was more graceful and decorative, and lastly the Corinthian which was the most decorative out of all and very “over the top.” This period could have been referred to as the Hellenistic period of architecture. This Humanism way of expression appeared again in the Renaissance where most of the buildings and sculptures had a lot to do with mathematical proportion just like Leonardo Da Vinci´s Vitruvian Man theory. 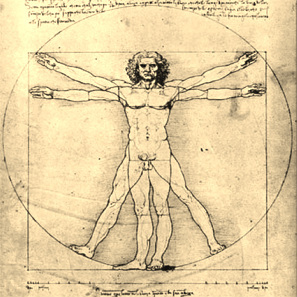 In this theory he believed that the perfect mans arm span and height should both be the same amount of lenght - if this was the case, you were the “perfect man” in Da Vinci´s mind. This theory still gets used a lot in our daily lives. Art was a very important part of Humanism since it represented many different areas. Even now one is still able to find this type of art, which was the origin for individual accomplishments. This is a picture of all the different types of architecture. First Doric, in the middle Ionic and at last Corinthian. Leonardo Da Vinci´s Vitruvian man. One of the very famous sculptures. What is humanism? Humanism is the focus on the accomplishments of the individuals. Renaissance Humanism started from the 15th century to the mid 17th century, however the basic idea of Humanism originated in classical Greece around the 5th century, BCE. For Humanists education, emphasis on the individual achievement and emphasis on classical Greek and Roman text was important. The first known Humanist that focused on Literature and that we know of, was the English poet Geoffrey Chaucer. He played a big role in English Literature. He is considered as the father of English Literature. During his lifetime Geoffrey Chaucer achieved a great amount of fame as an astronomer, author, alchemist, and philosopher. Humanism in the Renaissance had big changes in the way people thought about different things. People of the Middle Ages thought that life was meant to be hard. Then, around the 14th century (1300s), people in Florence started thinking very different about life. To find out that life was different, people studied books, and writings. Also as soon as people started getting an experience of the new ways of living and life, they started producing new writings, manuscripts, and books. Once people where able to start a new way of living and life, a new era started, called Humanism. After producing all these readable materials and selling them, Florence became one of the richest cities in Italy at Renaissance times. In Renaissance Humanism writers looked upon many works of ancient Greek writers such as Aristotle, Plato, and many other ancient classical writers. Before Renaissance writers and poets started writing about the Bible, they also wrote about many other different topics. Ideas from the Renaissance were rapidly included in northern European Literature. In England poets and playwrights such as Spenser, Shakespeare, and Marlowe used lots of Renaissance ideas in there works.